In May, Halmos College of Natural Sciences and Oceanography Assistant Professor Nicole Fogarty, Ph.D. and M.S. in Marine Science candidates Megan Bock and Morgan Hightshoe traveled to the Smithsonian Institute’s Carrie Bow Cay Field Station in Belize. This group conducted coral reef experiments that were focused on identifying resistance to disease in the three Caribbean acroporid corals, Acropopra cervicornis, A. palmata, and A. prolifera. 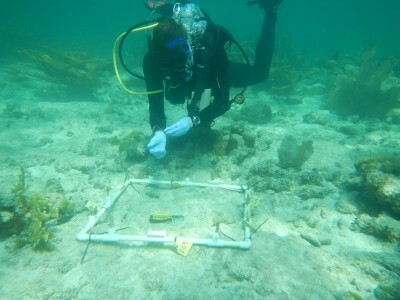 The Carrie Bow Cay Field Station is located fifteen miles offshore on the Meso-American Barrier Reef and has been hosting scientists from around the world for over 40 years.